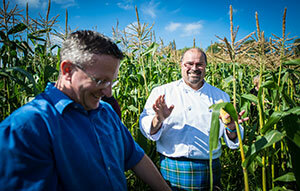 Join The Kilted Chef, Alain Bosse, on a culinary journey from the pasture, to the sea to your plate. 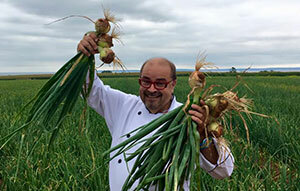 Cooking on the Farm is a full-day, hands-on culinary experience you will never forget. Start the morning sourcing local ingredients from fish purveyors, butchers, abattoirs and farmers. Learn how to select the freshest seafood and vegetables as well as to identify what types and cuts of meat work best for certain recipes. After selecting your ingredients, return to Chef Alain’s farm for a light lunch before beginning your personalized cooking class. Part of the educational component includes knife skills using Grohmann Knives. Handcrafted in Pictou, Grohmann Knives are recognized around the world for their beauty, balance and quality. At the end of the day, enjoy the meal you made paired with Nova Scotia wines. 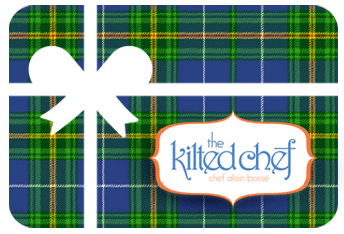 Pick your date for the 2019 Culinary Adventure at the farm with The Kilted Chef. Starting July 18, Aug 30 and 31, Sept 28. 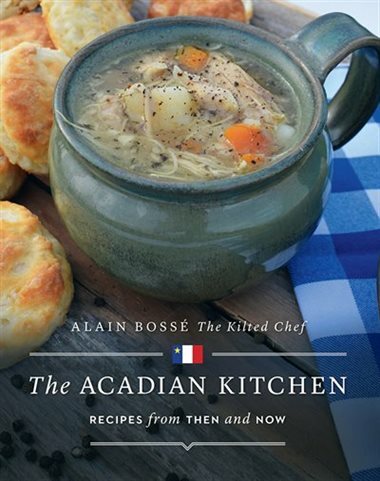 The aroma of rappie pies baking in the oven, rich fragrant broth bubbling on the stovetop for the evening’s fricot, buckwheat pancakes frying in a cast-iron skillet-these are the tastes and smells of traditional Acadian cooking, brought to life in “The Kilted Chef Alain Bosse’s new book, The Acadian Kitchen: Recipes from Then and Now. The Acadian Kitchen is a landmark guide to Acadian history, culture and the time-honoured foods that define its one-of-a-kind heritage. With chapters on chowders, pies, preserves, classic desserts and much more, The Acadian Kitchen captures an extensive variety of Acadian dishes, both new and old. Sea Side Treasure Trove, Pictou NS Masstown Market, Masstown NS The Pork Shop, New Glasgow NS, Mack restaurant Equipment, New Glasgow NS Mrs. McGregor’s Shortbread, Pictou NS L’Ecluse Restaurant, Edmunston NB Centre Mi-Careme, Cheticamp NS Grand-Pre National Park, Grand Pre NS Gros Morne National Park, NL Pictou Lodge resorts NS Logan’s Fish Market. The story of Mussels starts with "the humble mussel, a shellfish so unassuming that the impact it had on the two of us was quite unexpected," as the authors—the "Kilted Chef" Alain Bossé and his good friend "Mussel Mama" Linda Duncan—of this book say. When these two met, they discovered they shared an identical passion: to get the word about this sensational seafood out to as many people as possible, as quickly as possible. This cookbook, Mussels, is the satisfying result. It includes 77 recipes for using mussels in every type of dish, from where you would expect them—in appetizers, salads and mains—to where they are a delightful, whimsical surprise—in pickles, pies and cocktails. Mussel Strudel, anyone? Mussels is for anyone who is passionate about mussels and looking for new ways to cook and eat them. This mighty mollusc has long been a staple on restaurant menus but many people still hesitate to cook mussels at home. This book shows how easy it is to choose, store and cook this healthy and tasty seafood. Everyone who wants to can now cook mussels with confidence.